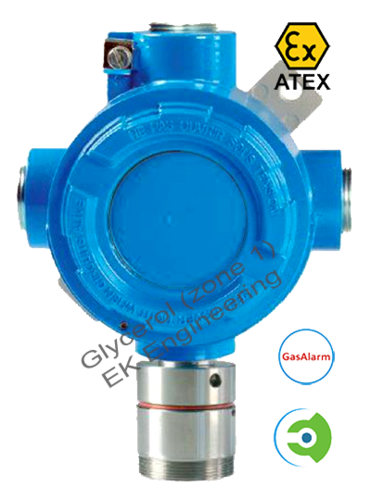 Providing you the best range of Formaldehyde Sensor (Toxic), Transmitter, Detector Analyzer, Hydrogen Chloride (HCL) Sensor, Transmitter, Analyzer, Hydrazine (N2H4) Sensor, Transmitter, Analyzer, Detector, Freon Refrigerant Sensor, Silane (SiH4) Sensor, Transmitter, Analyzer and Ethylene Sensor (Toxic), Transmitter, Detector Analyzer with effective & timely delivery. Gas type available: chemical, paint, explosive, alcohols, disinfectant, biocide, embalming agent, manufacturing, textile industry, resins, EPA, OSHA, TWA, STEL, NIOSH, gas detector, gas sensor, gas analyser, gas detection system, gas sensor transmitter, gas transmitter, automobile, nuclear, continuous monitoring, coal mines, food processing, bakery, oil & gas, toxic gas, combustible gas sensor, combustible gas detector, battery room, ripening chamber, cold room, building ventilation, parking ventilation, pharmaceutical, labs, clean rooms, filter monitoring, mine ventilation, bottling plant, gas reticulation, hospitals, steel, rolling mills, paint booth, level monitoring. Gas type used: Chemical, paint, explosive, alcohols, disinfectant, biocide, embalming agent, manufacturing, textile industry, resins, EPA, OSHA, TWA, STEL, NIOSH, gas detector, gas sensor, gas analyser, gas detection system, gas sensor transmitter, gas transmitter, automobile, nuclear, continuous monitoring, coal mines, food processing, bakery, oil & gas, toxic gas, combustible gas sensor, combustible gas detector, battery room, ripening chamber, cold room, building ventilation, parking ventilation, pharmaceutical, labs, clean rooms, filter monitoring, mine ventilation, bottling plant, gas reticulation, hospitals, steel, rolling mills, paint booth, level monitoring, leakage monitor, tunnel ventilation. Gas type available: chemical, paint, explosive, alcohols, disinfectant, biocide, embalming agent, manufacturing, textile industry, resins, EPA, OSHA, TWA, STEL, NIOSH, gas detector, gas sensor, gas analyser, gas detection system, gas sensor transmitter, gas transmitter, automobile, nuclear, continuous monitoring, coal mines, food processing, bakery, oil & gas, toxic gas, combustible gas sensor, combustible gas detector, battery room, ripening chamber, cold room, building ventilation, parking ventilation, pharmaceutical, labs, clean rooms, filter monitoring, mine ventilation, bottling plant, gas reticulation, hospitals, steel, rolling mills, paint booth, level monitoring, VOCs free paint. Gas type available: chemical, paint, explosive, alcohols, disinfectant, biocide, embalming agent, manufacturing, textile industry, resins, EPA, OSHA, TWA, STEL, NIOSH, gas detector, gas sensor, gas analyser, gas detection system, gas sensor transmitter, gas transmitter, automobile, nuclear, continuous monitoring, coal mines, food processing, bakery, oil & gas, toxic gas, combustible gas sensor, combustible gas detector, battery room, ripening chamber, cold room, building ventilation, parking ventilation, pharmaceutical, labs, clean rooms, filter monitoring, mine ventilation, bottling plant, gas reticulation, hospitals, steel, rolling mills, paint booth, level monitoring, leakage monitor, tunnel ventilation, internal combustion engine, IC engine, exhaust monitor. Gas type available: chemical, paint, explosive, alcohols, disinfectant, biocide, embalming agent, manufacturing, textile industry, resins, EPA, OSHA, TWA, STEL, NIOSH, gas detector, gas sensor, gas analyser, gas detection system, gas sensor transmitter, gas transmitter, automobile, nuclear, continuous monitoring, coal mines, food processing, bakery, oil & gas, toxic gas, combustible gas sensor, combustible gas detector, battery room, ripening chamber, cold room, building ventilation, parking ventilation, pharmaceutical, labs, clean rooms, filter monitoring, mine ventilation, bottling plant, gas reticulation, hospitals, steel, rolling mills, paint booth, level monitoring, leakage monitor, tunnel ventilation. Chemical, paint, explosive, alcohols, disinfectant, biocide, embalming agent, manufacturing, textile industry, resins, EPA, OSHA, TWA, STEL, NIOSH, gas detector, gas sensor, gas analyser, gas detection system, gas sensor transmitter, gas transmitter, automobile, nuclear, continuous monitoring, coal mines, food processing, bakery, oil & gas, toxic gas, combustible gas sensor, combustible gas detector, battery room, ripening chamber, cold room, building ventilation, parking ventilation, pharmaceutical, labs, clean rooms, filter monitoring, mine ventilation, bottling plant, gas reticulation, hospitals, steel, rolling mills, paint booth, level monitoring, leakage monitor, tunnel ventilation.